She entered service in March of 2002 for Festival Cruises and she and her sister, European Stars were the largest ships in the Festival fleet at the time. She served as an accommodation ship during the July 2001 G8 summit in Genoa and then missed a cruise in August due to problems with her Azipod propulsion system. 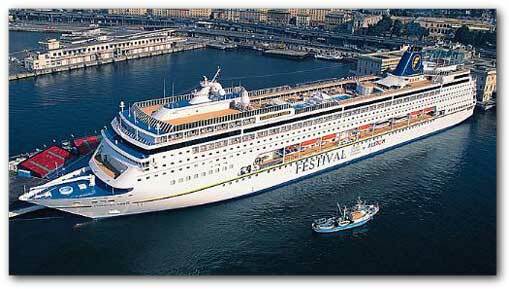 She joined the MSC fleet in May of 2004 after Festival ceased operations earlier that year. Our tour of the MSC Armoniastarts on Deck 12 aft where the Flamenco Discotheque, Galaxy Video Arcade and Teen's Club are located. Walking forward via either of the narrow walkways above the pool will bring you to the suite accommodations and a stairwell to Deck 11. Overlooking the bow on this deck is the Atlantica health club and beauty center which offers a wide variety of equipment and services. Moving outside and heading aft you pass the Pool Bar, The Bar du Palais and the Azur Bar which offers a variety of beers and the "Gelateria" ice cream bar. Next you pass the two swimming pools with semi-separate children's splash pools and two hydromassage pools. Past the pools is the La Brasserie indoor/outdoor restaurant/bistro which serves buffet food throughout the day. 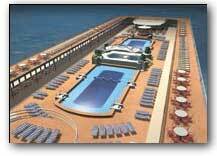 Deck 10, 9 and 8 consist entirely of passenger accommodations. The aft part of deck 7 is also passenger accommodations while the forward part includes the Amadeus Show Lounge, Goethe Library/Card room and a small bar. Deck 6 is where most of the action takes place, with the two deck La Gondola theatre occupying the forward part of the deck. The theatre consists of a single sweeping auditorium which is For easy access there are four entrances over two decks. As you exit the theatre's upper level entrance, you will pass through Cafe Quadri which overlooks the reception foyer and serves as central meeting place throughout the day. Moving aft you reach the Casino Lido, which is stark by comparison to some of the other ocean-going casinos but it is equipped with the standard ocean-going casino fare including roulette, poker, black jack and slot machines. Continuing aft you pass through the unusually large Business Center which is fully-equipped for hosting business conferences, sales conventions, lectures and similar group events. It includes, a cinema/auditorium with seating for 120, which can be increased to 200 by opening out 2 adjacent meeting-rooms, with video-recorder, television, screens, projectors, and equipment for simultaneous translation, and a fully-equipped work-station, with PC, fax and Internet connection via satellite. Just beyond the Business Center is the Piano Bar, a small shopping area, the Photo gallery and the entrance to the upper level of the La Pergola restaurant. The restaurant, which seats 640 passengers at a time, is a combination of modern and classic design with a creative use of lighting and decor. The quality the food and level of service on board are good. The lower level of the restaurant occupies the aft section of Deck 5. Midship on Deck 5 is another shopping area, a small bar and the Internet Cafe. The forward part of Deck 5 contains the Piccadilly Square reception area. 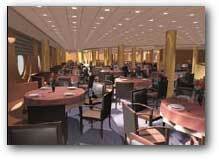 Extensive use of marble gives this area a modern look similar to that found on the newer members of the Costa fleet. The Ambassador Cigar Room, White Lion English Pub and lower level entrance to the Theatre are all adjacent to the reception area. Meals in are served in two sittings in the La Pergola restaurant and are geared towards the European market and as such are a bit richer than the typical menu on a Caribbean cruise. Besides meals in the restaurant are buffet breakfast and lunches upstairs in the indoor/outdoor restaurant/bistro on Deck 12. There are a total of 783 cabins on board including 132 suites with balconies. In general, the cabins are smaller than average although they all include refrigerators and televisions. The ship's 132 suites are more spacious and offer additional features such as a walk-in wardrobe and private balcony, a sitting area, bathroom with bathtub, as well as a wall-to-wall vanity counter. Your fellow passengers will be mostly Europeans of all ages. The atmosphere on board is lively and active with most passengers happy to party, swim in the sun, and explore the various ports. During summer and school holidays she attracts lots of families with lots of children. For the remainder of this year she will be sailing on g seven-night cruises leaving from Venice every Sunday and Bari every Monday for Corfu, Santorini, Athens, Katakolon, Dubrovnik and Venice. Overall she provides a good quality product and the staff on board aim to please. She can feel a bit crowded when the weather turns bad but if you open to mixing with a variety of passengers and languages, she is a comfortable ship to sail on.